All days are not the same. For me, THIS day, August 1, is different from all other days. Today marks 50 years since I fully surrendered my life to follow Jesus! Best decision ever! As I grew up, there were several significant decisions I made in relationship to my walk with Jesus. My sister reports that as early as three years old (she was 12) I prayed a prayer to ask Jesus into my heart. Several other times, I said, and meant certain prayers during Vacation Bible School, at Sunday School, at Summer Camp, etc. But during my high school years, I was not fully following Jesus and His ways. I wasn’t a bad kid, just not a fully surrendered one. When I was 19 I was asked to be a counselor at our church’s summer camp. Because of my past experiences with camps, I thought that would be a good idea. While there, I had to memorize the verses that the campers memorized so I could make sure they said them properly. Some of those verses were Romans 12:1-2. It was late on Thursday night, August 1, 1968 as I lay on my bunk pondering those verses, that I felt such wonderful conviction from the Lord. It was so heavy on my chest that I felt if I did not respond to His invitation to “present myself as a living sacrifice” I would be pressed right through the bunk! That was the moment that changed the entire trajectory of my earthly and eternal life! I simply offered all of my life and future to Him. That decision has impacted all the other decisions of my life since then. 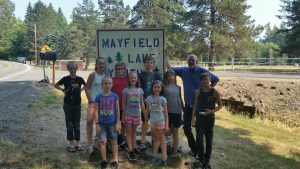 Two days ago, I was able to take 9 of my grandkids with me back to that same camp (Mayfield Lake Youth Camp), go to the same place where that cabin stood (it is no longer there), sit on the grass, and tell them the story. This was the last stop on our annual “Cousins’ Camp.” We had them memorize Romans 12:1-2. While at the camp, we repeated those verses. My prayer for them at the time was that they would always present themselves as living sacrifices to God. That was my prayer then, that is my prayer now.